We have been learning about treaties and how they help us work together as a collaborative team. 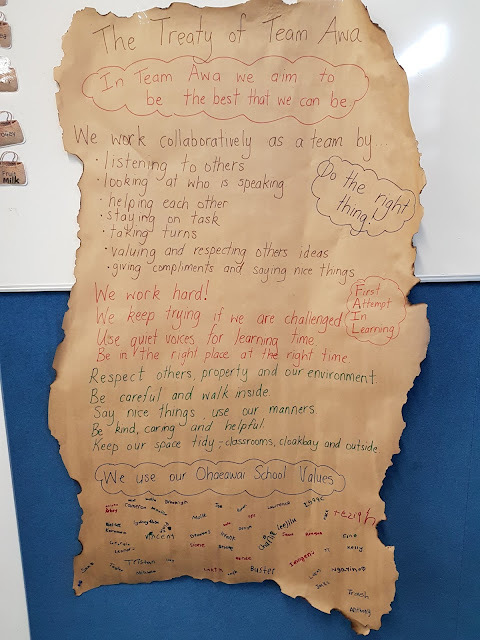 The children came up with lots of great values and rules they need to follow to be the best learners they can be. Love the Treaty Carmen. It looks like it got lots of buy-in from the students. a great blueprint for an effective learning environment this year. Hi my name is Julianna and I go to Pt England school. Good job keep it up. Hi team Awa my name is Ebony I go to Kawakawa primary and I`m in room 3 I like your treaty. I made one with my class last year and I liked your list of things that you put on it. A lot of good things I also like your school values very nice. Well done! I think the treaty is a good thing to look up to. I am going to say this again... WELL DONE! Hi my name is miria from kawakawa primary im a year 6 i love your treaty that you made great work and never give up in your dreams. I used to love burning the paper like that when I was your age. Great content and form. Well done. had a torn or writhing a positive thing. Hi my name is Lockie. I really like the paper that you used because it looks likes a pirate's treasure map but with your class treaty. I like how you are really saying positive words instead of don,t all the time . Have you already done all your class treaty rules yet? Hi my name is Sophie I am a year 4 from blaketown school. I like the way you ripped and burnt the edge of the paper to make it look older. Maybe next time you could add more information and longer sentences. hi my jai I'm from blaketown school my class has done our class treay but we have not done our singer. Hi my name is Charlotte I go to blaketown school it is a nice school to go to I love the way yous done that map thing it is so owsome. and was that a long time to do that because that is a lot of writing I could write that much and we could write more then that we could write 2 whole pages and do you have a playground at your school because some schools don't but we do have a playground and we also have trees. and we have a big school the classrooms are room 1 2 3 4 What numbers is your classrooms I really like school because we learn more stuff that we don't now how to do it and we have alarms.our school has a fire alarm, I loved it. Hi my name is Lilly .I like your class treaty.We have a class treaty to.Do you have a chromebook? Goodbye. Hi Team Awa my name is Sara Graham I am from Ohaeawai School I am a year 5. I like your treaty, your rules are good so you can be a good role model and that's what you will be when you listen to that treaty. Your treaty is amazingly awesome. It looks a lot like our class treaty.